How do kitchen designers and colour experts help clients with choosing paint colours for kitchen walls and cabinets without actually selecting colours for them? The answer lies in getting the homeowner to do a little homeowner. You need to think not only about what colours you like but also what colours you’d be happy to have around you every day. An excellent way to get to know more about your colour preferences is to look at the kitchen design ideas online and in magazines. The layouts and styles you see will influence your decision, and you’ll probably find that you instinctively lean towards certain colours. For instance, you might gravitate towards white. Or, you may think that white is too clinical and prefer off-white or cream coloured cabinets. Why choose just one colour? Keep in mind that a monotone kitchen isn’t very pleasing. 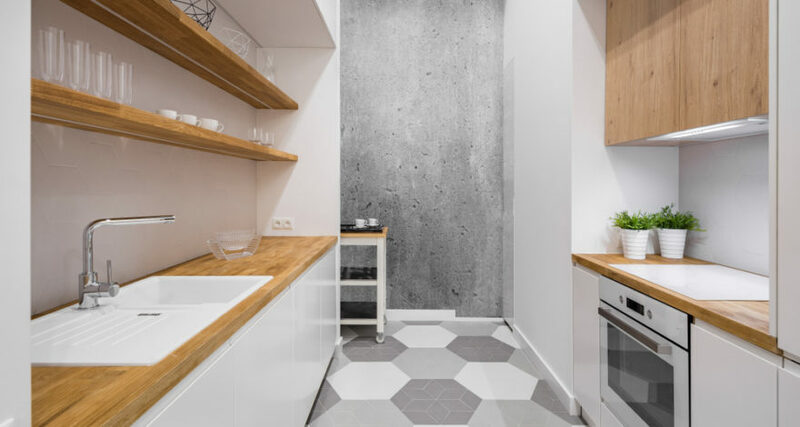 Even a minimalist kitchen will feature a variety of shades of grey or white. Subtle shade variations can give your kitchen the extra touch of style it needs. If this is still too stark for your taste, a dash or two of colour may be just what you need. For a colour palette of mostly white and grey, consider adding a bold coloured splashback for a sophisticated and cheerful look. If you’re ready for a fresh take on colour in your kitchen, but you’re not ready to paint the whole room, try painting an accent piece in a trending colour, such as a bench, instead of cabinet doors. Play it safe or take a chance? You may want to take more of a chance with your paint colours, but you’re holding back because you’re unsure if the colour you want will work in your kitchen. As long as you don’t overdo it, there’s no reason why you can’t take a chance with trending colours. Don’t be afraid to experiment with black accents, shades of blue and mint green. Want to add some warmth to the space? Try using dusty pinks or even terracotta. If in doubt, keep in mind that cool paint colours paired with warm woods are always a great choice for a kitchen colour scheme. Gorgeous kitchen colours come to life when you open yourself to the possibilities. For help with your kitchen colour scheme and painting, speak with the expert team at APMG Painting Melbourne. We’ll help you to make the right choice.